I'm installing a speedometer on my gf's bike, and i've run into a problem. When trying to attach the wheel sensor to the bike fork and the magnet to the spoke i realized there was not enough clearance. There is only enough clearance between the spokes of the bike and the fork for the sensor to fit in (the clearance seems uniform throughout the length of the fork). So it is impossible for the magnet to face in towards the sensor because they would hit. I thought about attaching the magnet to a spoke that goes to the other side of the wheel but the directions for the speedometer i have said to not place it more than 2 mm apart. Am i doing something wrong? or do you have any suggestions on how to install the speedometer. Try moving the sensor on the fork a bit further away? A photo would help. If it's wireless or has a cable long enough, you could go for the rear wheel. The higher you move on the fork, the more clearance you must have as the spoke moves towards the rim. OTOH, if you have a mounting issue, try to put the magnet on the opposite side spoke and see if the sensor picks it up. I had to do that on a friend's bike the other day (not much room to move the sensor due to it being a dual cadence/speed sensor) and being mounted on the LR chainstay. I agree that a picture would help, but I'm going to ask the obvious. Most of the sensors out there these days are designed to be mounted to the leading or trailing edge of the fork, not the inside of the fork. Are you trying to mount it the correct way? Here is a Cateye Strada Wireless sensor correctly installed on the fork - the magnet on the spoke is to the left of the sensor. I think you just need to move the sensor a bit farther from the spokes. Rotate it around the fork leg. FWIW, I much prefer to mount the sensor on the front of the fork. I know that it it interferes with aerodynamics and doesn't look as good, but if bumped - it won't be dragged into the spokes. This is especially important with the tight clearances of higher-end bikes. If the near-side spokes are too close, then there should be no problem using an opposite-side spoke. Just move the magnet farther out on the spoke (whilst sliding the sensor farther up the fork) and you should find an approprite point. I would think that with a front-mounted sensor, if it were bumped it would have a much worse encounter with the spokes - possibly torn off and damaging spokes on it's travels. From the back it would just click the spokes like a baseball-card. Only if you're backing up. 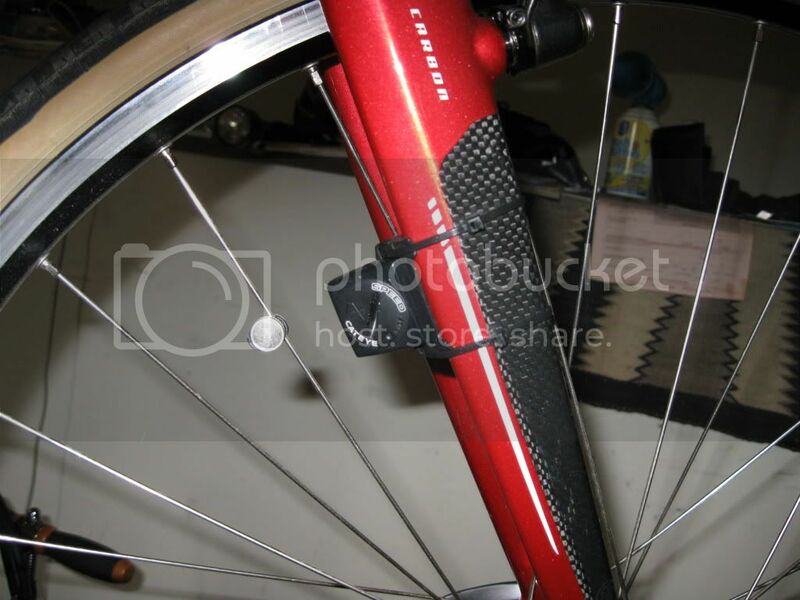 On the pic you posted above with the sensor mounted on the rear of the fork, if the sensor gets bumped inward somehow, the spokes may snag it and/or drag it in further and cause damage. With it mounted on the front of the fork, you would tend to have the baseball-card effect in a similar bump-in. Remember, the spokes are normally traveling towards the rear of the fork and away from the front of the fork. This is true. The sensor needs to be mounted on the other (left) fork leg, on the front with the window facing the spoke. I think I might argue the "correctly" part of that statement. In the rear of the fork like another said, it can get dragged into the spokes. On my Strada the battery faces the wheel also although I will say mine appears to be a newer generation than yours. Interesting. Thanks for the input. I'm sure either way will work - I just followed the directions on the first one. Bought a second one as the first works so well. Installed that one with no instructions needed. I recommend the Cateye Strada Wireless due to their simplicity of installation - and their mindless ease of use. Edit: deleted. (other people already commented about the direction of Panthers007 sensor). Hi, and don't laugh, but this is a true story about installing a CatEye Strada Wireless. Well, I mounted it and went for a ride and it was great, so I came home and decided to actually finish the mounting. The final mounting would involve placing the wheel magnet, using the black zipties that came with the kit on the fork, and placing the display on the bar where I can move my hand easily to change display features. After 5 or 6 attempts to get a reading (and I tried everything I could think of), the display unit would simply not pick up a signal. I would lift up the stem to get the front wheel off the garage floor, and spin the wheel, and nothing would happen, except that now and then, I would get a couple of seconds of activity. I bought and installed new batteries, re-installed the sensor on the fork, re-initialized the display unit about 3 times, and even read the manual! Finally, I took the unit back to the LBS where I got it and got a new one, same brand and model, and brought it home on Saturday. Followed directions assiduously. Nothing. On a complete whim/hunch, I rolled the bike about 8 feet away from the furnace adjacent to my bike service location (the ultra high-efficiency jobbie with all the techno fan and heating features) and Zowie! Best guess is that the furnace creates an electromagnetic field around the fan motor and controls, and the field is strong enough to affect the wireless transmission when the bike is essentially leaning on the furnace. Anyway, problem solved. Now waiting for the rain to stop . . .
Do not get up set if you use a head light. It will also kill the computer. Some intersection stop and go lights will cause a malfunction where your speed go up to 78 mph standing still. That only happens when you buy cheap computers. Wireless computers are indeed subject to RF interference as is any wireless device. Some are "coded" to reduce the problem but none are immune. Several years ago, following heart surgery, a friend's doctor recommended he use a heart rate monitor as a stress indicator when he began to ride again. Having no experience with these things and not wanting to spend a lot on a Polar he got a low cost Nashbar house-branded one. On our first ride we went by a local electric company's transformer station and his heart rate monitor zoomed up to 250 bpm and then down to zero! The effect on my unsuspecting friend can only be imagined. For a moment, he thought he was dead! Fortunately the monitor returned to a reasonable reading very shortly thereafter and we realized what must have happened. We never trusted that thing again.